We also specialised in prototyping custom PCBs, sourcing parts, assembling PCBAs (including flashing and testing) for hobbyist at an affordable price! Click us for more info! The first thing in creating or designing your own PCB (Printed Circuit Board) is to create the Schematics diagram of your circuit board. Schematic diagrams are like recipes for electronics. They tell you exactly how to connect the components to make a certain circuit. There are a lot of schematic diagrams readily available on the internet. So even without knowing any theory, you can actually build some pretty advanced circuits. As long as you know the practical steps on how to build a circuit. But before you can create Schematics diagrams of your own, you need to understand what each diagram mean in order to better design your PCB layout. Below we listed five of the top PCB Schematics posts we think are useful for beginners in the Makerspace domain. 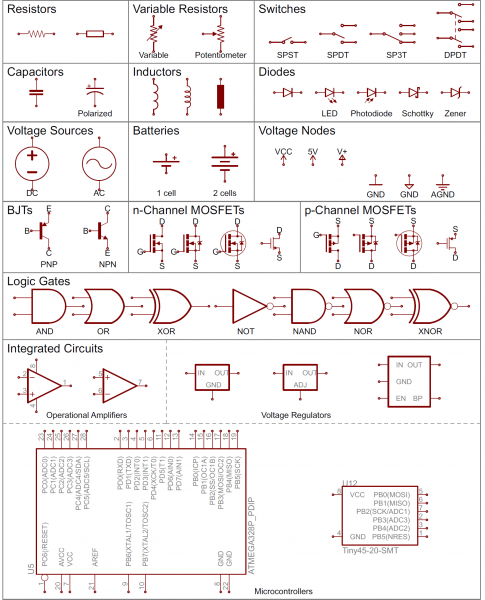 Sparkfun created this handy tutorial on what is usually included in a schematics diagram. Their posts list out what each of the Schematic symbols signifies and gives you a concise explanation of each. Check out their tutorial here. Build Electronic Circuits explain Schematics in more layman terms by telling the readers that Schematics can be easily read even for the beginners. It is less depth than Sparkfun’s version and more of bite-size anecdotes of the many posts it has on the topic itself. It gives a step by step introduction and guides readers to suggested links that are related to the article. They also provide a nifty video on their post about the topic. Check out the article posts here. Another post aims for beginners on schematics is by Starting Electronics. It provides an explanation with helpful diagrams and also provides general circuit diagram rules for beginner to follow in order to create their own schematic diagrams. Read more about their post here. This is a simple guide that shows diagrams of each symbol in a Schematic diagram. According to EDraw, reading schematics is all about recognizing the symbols and lines to see how they are connected. Therefore, to be able to read electrical schematics you need to know electrical schematic symbols and which wires connect to which component and how each line flow in an electrical schematic. Check out their post here. 5. How To Read Circuit Diagrams by Applauche on Instructables. Final but not least is a post on Instructables by applauche on how to read Schematic diagram. With almost a million views, this post deserves a mention in our list. This is a must-read post on instructable. He explains exactly how to read all those confusing circuit diagrams and then how to assemble the circuits on a breadboard. Check out his instructable post about it here. There you have it. The top 5 posts we think is a useful reference and guide for beginner makers and hobbyist to understand what schematics are and to start designing their own PCB from scratch. For more PCB guide blog posts we have installed check them out here.